You watch what you eat, train with determination and make a habit of challenging yourself with ambitious goals. Here's your reward for all that hard work. 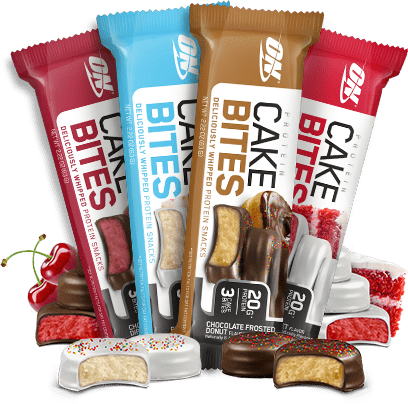 ON's Cake Bites pack 20 grams of protein into delicious dessert treats that taste like you're cheating when you aren't. With less than 5 grams of sugar and under 250 calories per 3-cake serving, this protein on-the-go option delivers serious sweet tooth satisfaction. Optimum Nutrition is legendary for both quality and innovation. In addition to producing the world's best-selling whey protein, ON's Gold Standard 100% Casein introduced slow-digesting nighttime protein to the weight training world and Amino Energy created the anytime energy category in sports nutrition. When technology makes advancements possible, ON will be the company bringing it to you.